Most tiny homes tend to go for the standard “less is more” strategy when it comes to interior design. 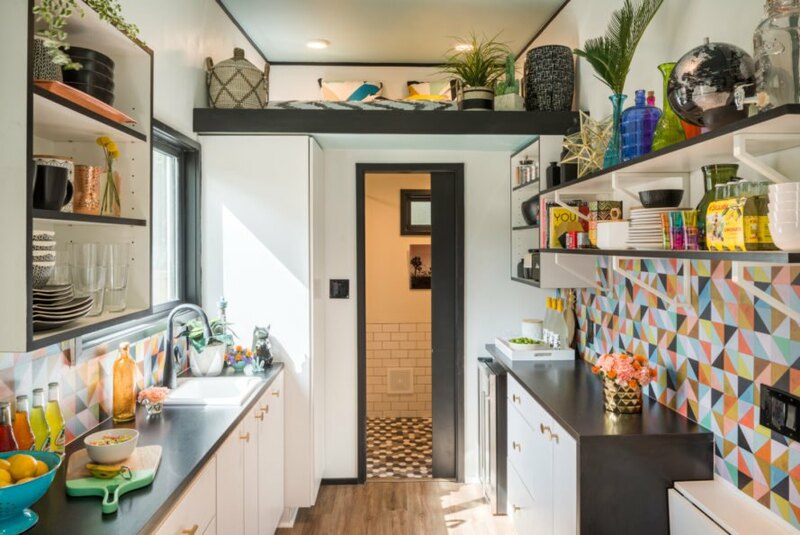 But one Texas designer, Galeana Younger from the Galeana Group, is breaking that mold with her stunning “maximalist” tiny home. 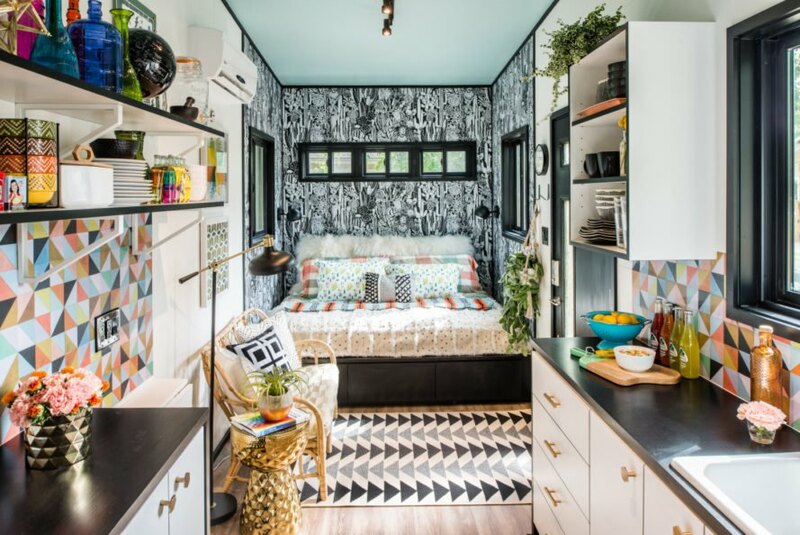 Forgoing the typical neutral color palette, Younger decked out the 190-square-foot tiny home with a host of vibrant colors, funky patterns and plenty of personal touches that give the home a jubilant character. Accordingly, the bold interior design found throughout the home has quite a bit of “spark” from the moment you enter. The living space features a small wicker sofa covered with various pillows in an array of colors and textures. To the right, the bedroom is wallpapered in a lively black and white cactus print. Contrasting the busy pattern on the walls is the ceiling, which is painted a light ethereal blue. A triangle-patterned rug is on the floor, nicely connecting the black door and trim, which is found throughout the interior. Moving into the kitchen, the blast of fun, vibrant colors cannot be missed. The geometric backsplash is comprised of multiple hues and shades that add a sense of whimsy to the cooking area. 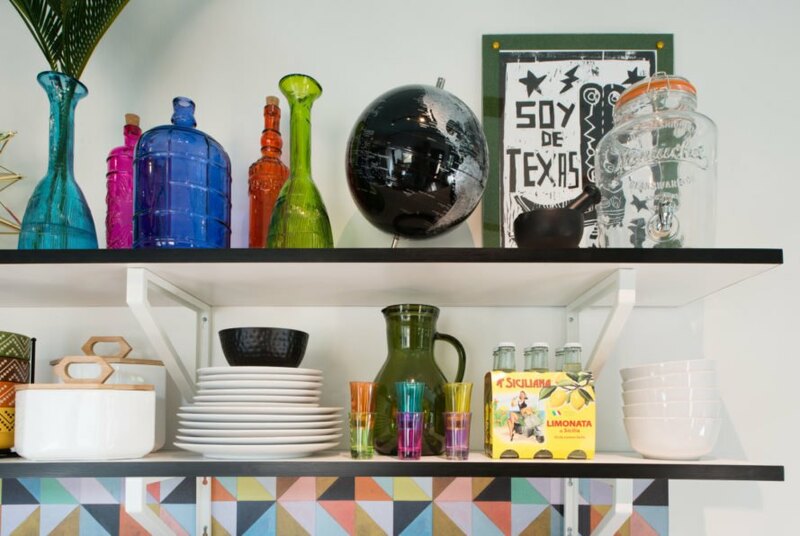 Open shelving stores the home’s dishware along with decorative bottles in different shapes and colors. Further into the back of the space is the bathroom. 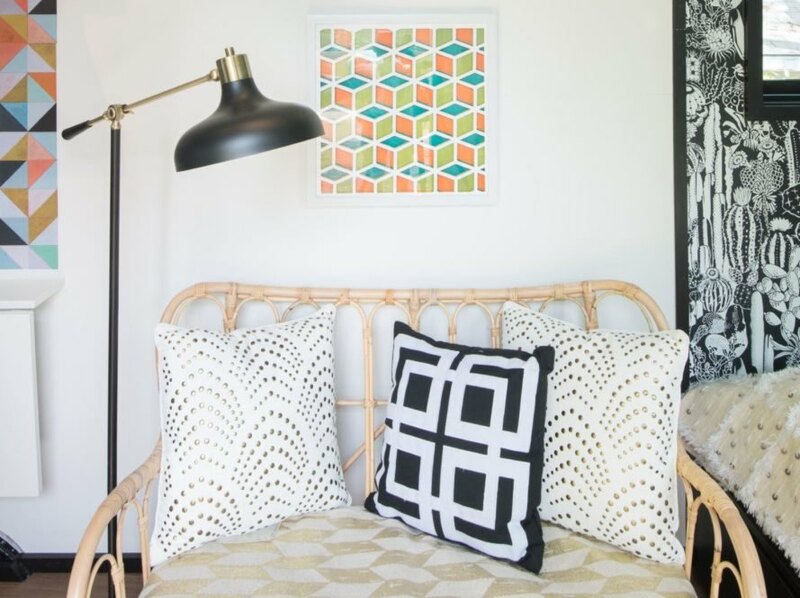 Surprisingly spacious for a tiny home, this black and white motif still manages to be filled with personality. 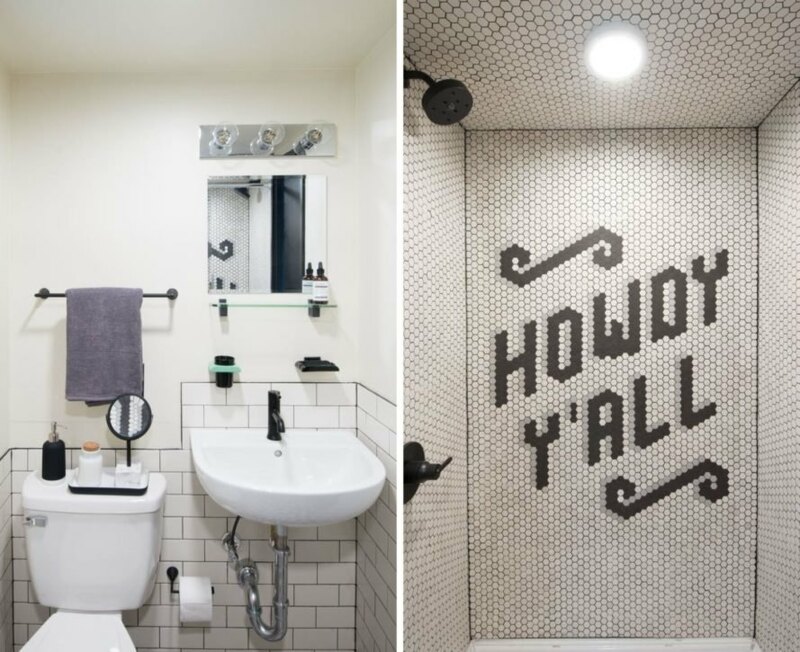 The shower stall was hand laid with the words, “Howdy, ya’ll.” Above the bathroom, a ladder leads to a compact sleeping loft. The 190-square-foot home was designed by Texas designer Galeana Younger. 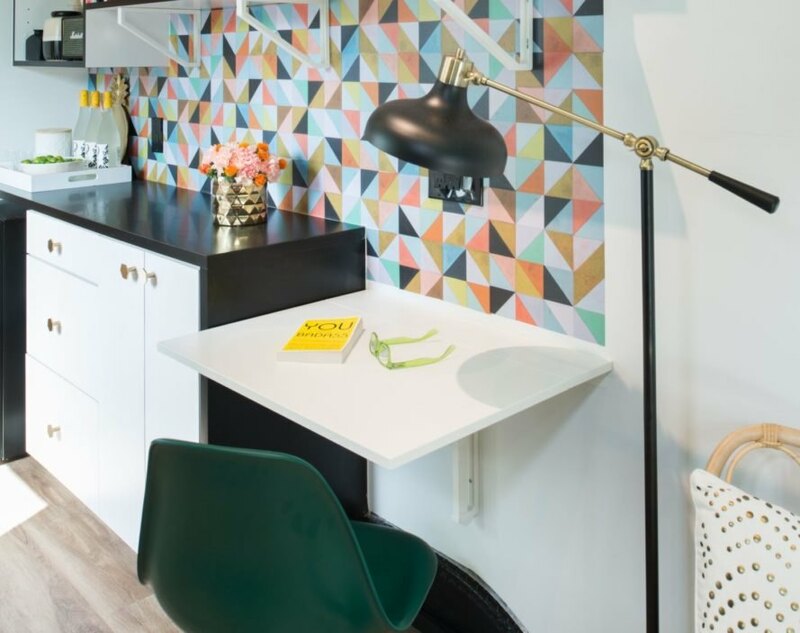 While most tiny homes seek a minimalist feel, this tiny space is filled with bright colors and patterns. The interior design is filled with decorative touches. The home is filled with multicolored tiles and plenty of shelving for knickknacks. 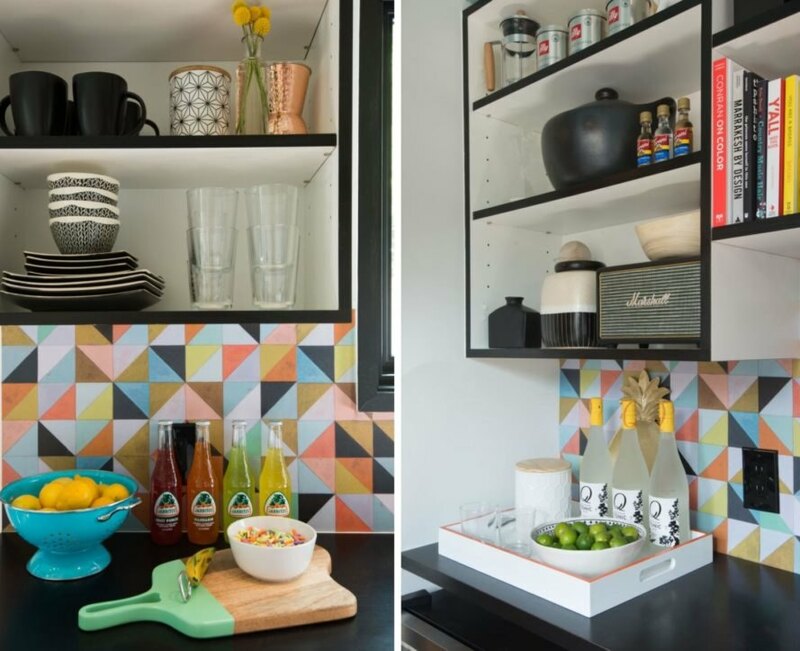 Colorful tiles give the kitchen a vibrant atmosphere. A small seating area adjacent to the kitchen doubles as dining space and an office. There are plenty of shelves to display the homeowners' eclectic style. Plants and decorative items can be found throughout the home.